Tuitorial by Sw Eden or Proud (Sw-Eden.NET) ; Please do not use in other websites and do not publish. 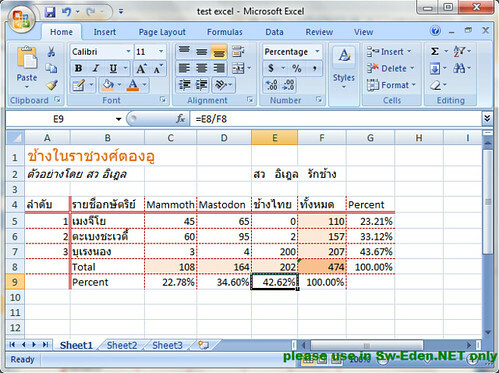 Main purpose is to teach students at Plearnpattana School. Mostly, start button is at low-lft cornor of the desktop. 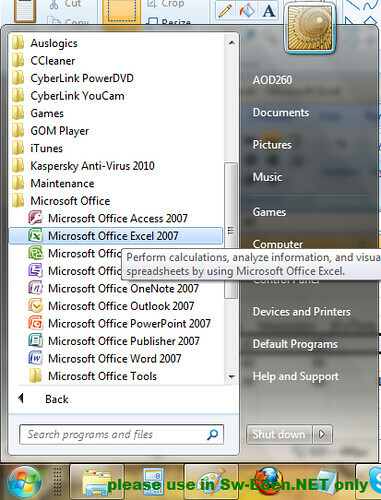 Click the start button, and then, ‘All Programs’, then click ‘Microsoft Office’ and then click ‘Microosoft Office Excel’. Firstly, type the beginning of the series at least 2-3 numbers. For example, 1,2,3 or 2,4,6 or 1,space,2,space,3,space. 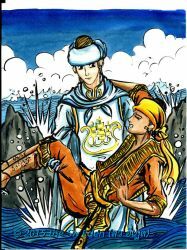 You can do both in verticle and horizontal way. When you hold your mouse and pull it down, you will see a little number at the right corner of the highlight area, telling you the current number of your serie. 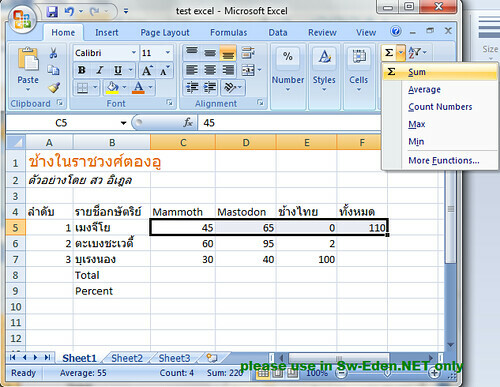 Just select or highlight any cells, and make a right click, you will see all those options. You can also see these options from ‘Home menu’, too. 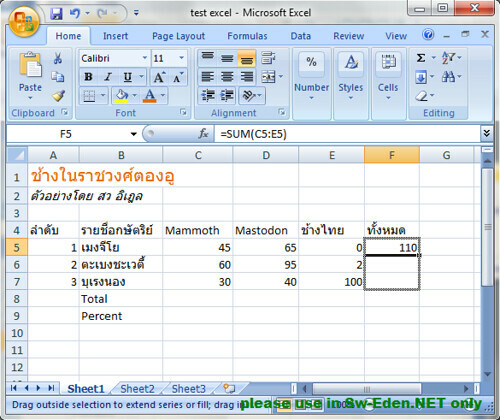 Firstly, you have to select two or more cell with number. Then, you click ‘Sum’ symbol. 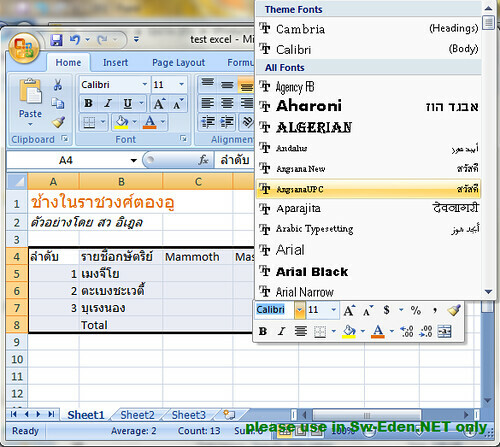 Or, you can type down the formula yourself, =SUM(the beginning cell:the last cell), such as =SUM(A35:A39) . ** You can also pull the Sum as well as you pull a serie of number. 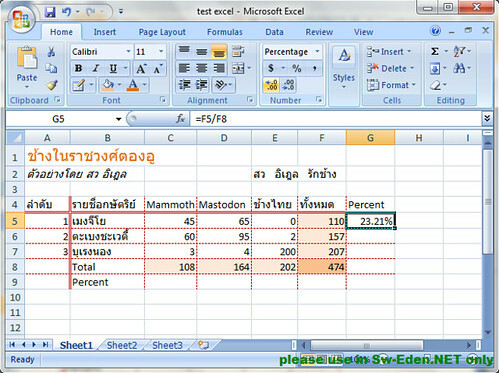 If it is not too complicate, you would get a right results as you can see in our example. 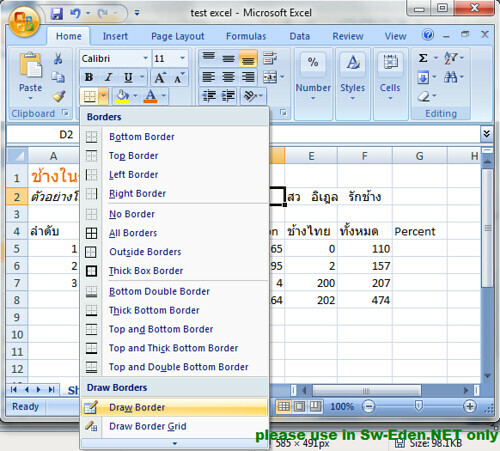 If you are no other program, you may see ‘Table and Border’. 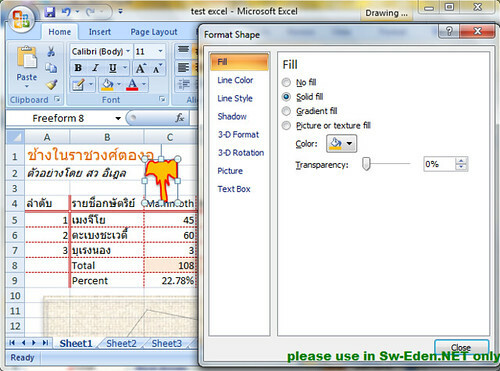 Excel format is already a hugh table, so to make it not so complicate, we should draw its borders to define each area. 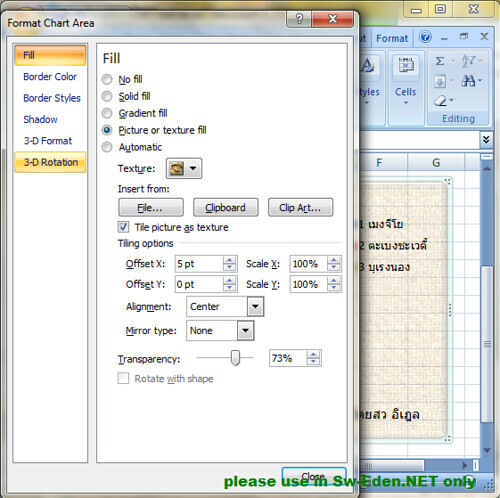 When you click ‘Border’ button, you will see many options which are so easy to understand how to use. I recommend you to use ‘Draw Border’, so you can draw all the lines freely. If you like to change the line thickness or colors, all the options to chages or erase are below there. Highlight any cells and click ‘Fill Color’ button. This is another way to define the area. You may highlight just only important cells, or if your table is long in horizontal, you may highlight by skip line. 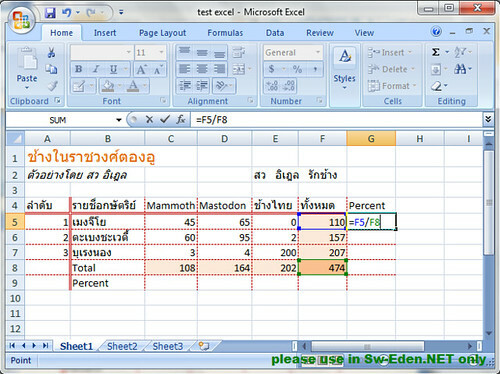 You can highlight and pull the selecting down as well as you do in series of number. If you do the series of Fill Color after series of number, the program default will mess your series of number, so you must look at a little square at the low-right corner of the area after you finish the serie of Fill Color. Click on that little guy, and say ‘Fill Format Only’. 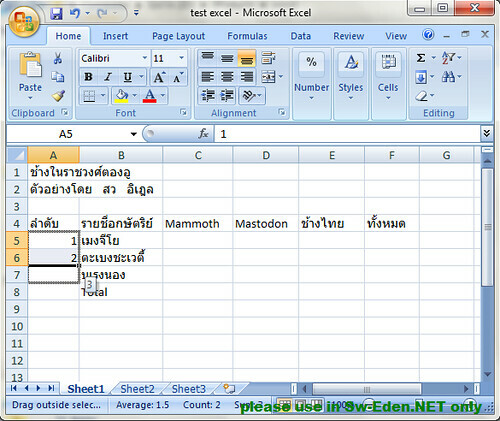 Firstly, you type ‘=’, then click on the first cell, and type ‘/’ then select the second cell. To devine it as percent, you just click button, ‘Percent’ (%). So you do not need to multiply it by 100. 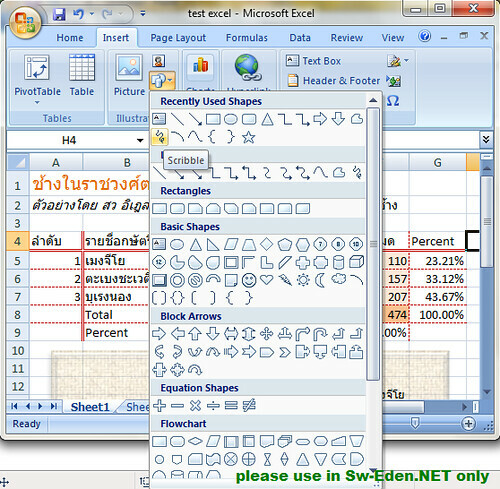 **Any weird crazy formulas, you can choose from Formulas Menu. 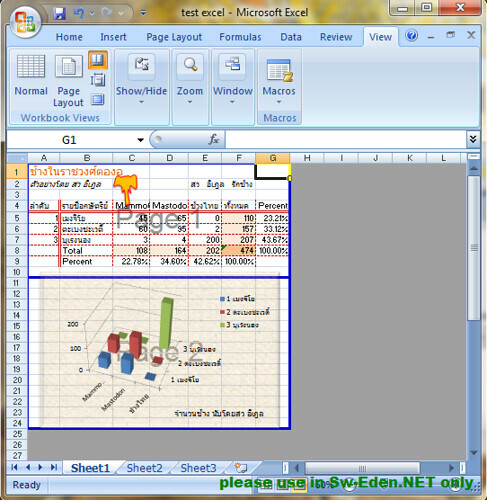 You can do both select cells first or type of chart first. 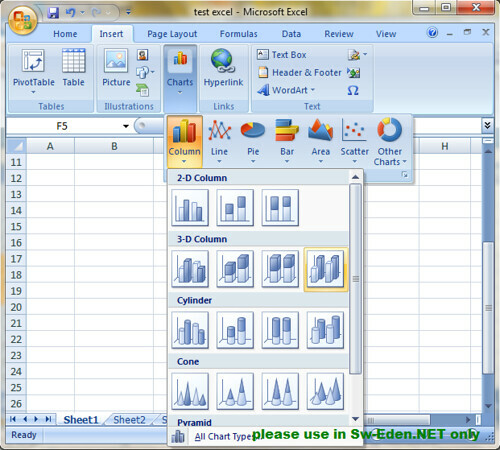 If you select type of chart first, Excel will automatically select the data for you. 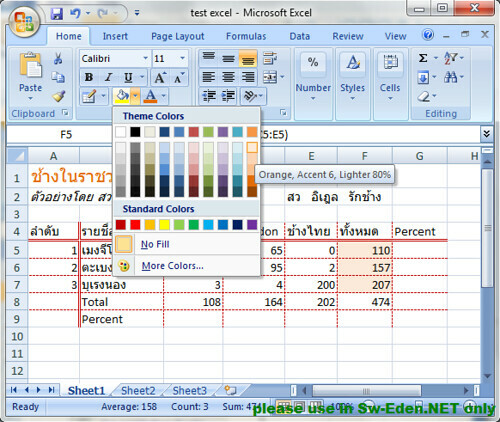 You will see the colors in the chart related to the colors of selecting areas. You can adjudge the selecting area. 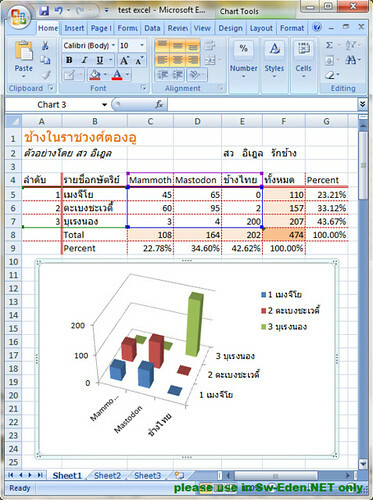 Its results will suddenly appear in the chart. 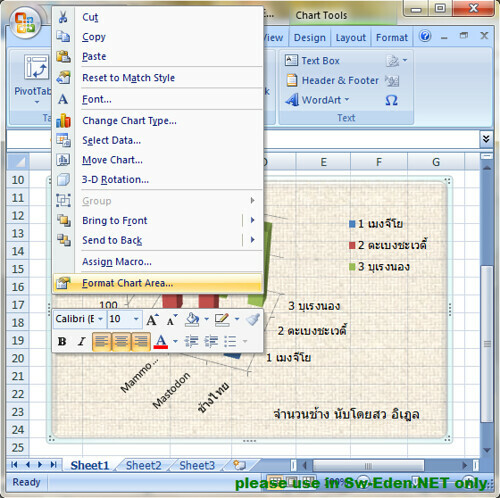 When the window of ‘Format Chart Area’ pop up, you can decorate your chart as much as you like. You can put your picture as background (Say ‘Insert from File’). If your chart is 3Ds, you can do a 3D Rotation to adjudge your chart to a right angle you need to show your data. You would see ‘Shapes’ button in Illustrations tab in Insert Menu. If you do not like any shapes they give you, you can draw your shape yourself. When you finish inserting the shape, you can change its colors and line at Home Munu. Your chart or information may bo longer than letter paper or A4 paper, so you need to manage things to put on each peper. Go to ‘View’ Menu, and click ‘Page Break Preview’. The blue line is the edge of papers, so you can move it to the right place to group the similar information in one page.